Only Shawn Micallef would pair “cozy” and “urban,” and only he would link Robert Frost’s poem about the woods to a city, let alone Toronto. His view of Toronto having the intersection of nature and city is a tad more romantic than I would normally think, and it’s just this romanticism that makes Micallef’s Stroll such a great book. Micallef views his city with an almost childlike sense of wonder. Informed, certainly, by his vast knowledge of the city’s history, as well as conversations he has had with various others, but there’s a youthful excitement in Micallef’s approach to exploring Toronto. Remember how when you were a child, even an office cubicle can transform into a land of adventure? That’s the view Micallef presents of Toronto — every sidewalk is a path to adventure, every building a potential locale for a story. Hear hear, Mr. Micallef. In Stroll, Micallef chronicles his wandering walks around Toronto, covering the downtown core, and, more significantly, spreading out into Pearson Airport, North York, Scarborough and the Port Lands. 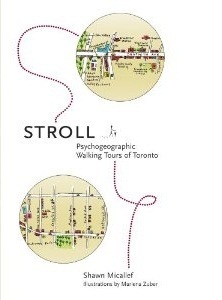 I know of Stroll readers who take their copy with them as they walk around Toronto themselves, perhaps using it as a guide, to point out things they may not have noticed on their own. I opted instead to read Stroll at home, enjoying the treat of dipping into it and checking out a neighbourhood or two at a time, mini adventures where my imagination took me on these tours. Reading about neighbourhoods I was familiar with is quite an experience — as Micallef’s narrative moved along certain roads and noted certain landmarks, I could picture these areas clearly in my mind. Once in a while, I’d learn a fascinating tidbit about the history of a building I’d passed numerous times without noticing; other times, Micallef would mention a detail I hadn’t noticed at all, and I make a note to take a look myself next time I was in that area. Reading about neighbourhoods I’d never visited is a different kind of adventure. In a way, it’s not quite as thrilling — I no longer had the memory of the landscape to guide my imaginary tour. On the other hand, this just means that all these neighbourhoods are still waiting to be explored. As Micallef says, you realize how large Toronto is, to be able to fit all of this in it. Toronto through Micallef’s eyes is an adventure. His affection for the city is infectious, and he punctuates informational tidbits with humour and whimsy. I highly recommend this book for tourists, new Torontonians, people moving away from Toronto, and anyone, really, who wants to view the urban landscape in a new way. I recently joined a Jane’s Walk that Micallef led. At one point, he stopped walking, glanced around and, for no discernible reason (at least to me), stepped onto a patch of dirt and grass and zigzagged through that rather than stick to the pavement. So much of my walking around, at least, involves getting from one point to another (in other words, I would most likely have stuck to the pavement). Micallef’s seemingly aimless wander opens up familiar locales to adventure, and that’s why Stroll is such an amazing book. It helps as well to have Micallef’s highly romanticized view of his surroundings, picking out random details that would usually escape attention and finding the whimsy in them. During that Jane’s Walk, Micallef stopped by the 403 and told the group to close our eyes and listen to the cars zipping past. You could almost believe, he said, that you could hear the ocean. That’s a bit of a stretch, Mr. Micallef, but hey, why not? I’ll give it a try. This entry was posted in Book Reviews and tagged 50BookPledge2012, Coach House Books, Non Fiction by Jaclyn. Bookmark the permalink.